The Cats of University Heights: E.T. 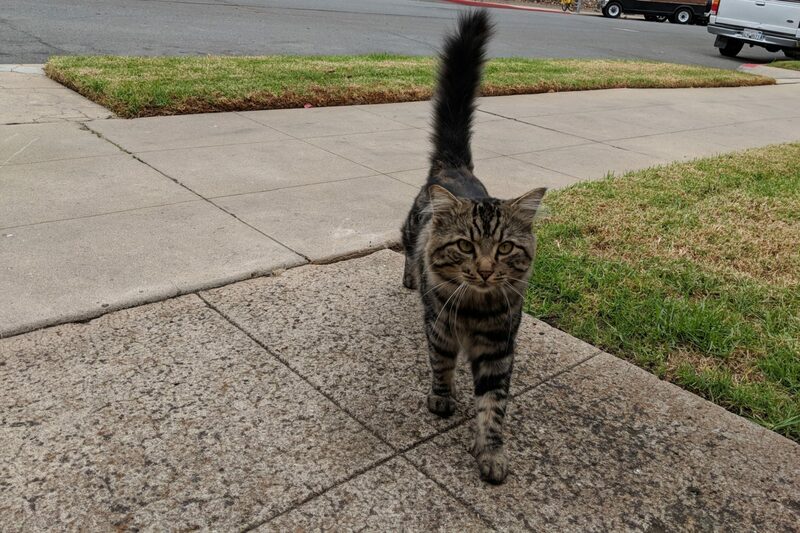 As my wife and I approached the Adams Ave. overlook on April 7, 2018, she spotted a beautiful, bushy-tail tabby skulking behind two cars parked before the canyon. The furball then lay low beneath one of the vehicles, barely visible in the shadows. I have only ever seen one other cat, Grand, in this location— most recently in July 2017. I am a deliberate shooter, who typically captures an average three photos per subject. But in this instance—laying down on the ground wearing sunglasses and manually focusing Leica M (Typ 262) on a darkened subject—I shot blindly about a dozen-and-a-half portraits from two vantage points while turning the focus ring (and adjusting the aperture). Among them, only one is truly worthy, while denying you glimpse of the magnificent tail (sorry about that). 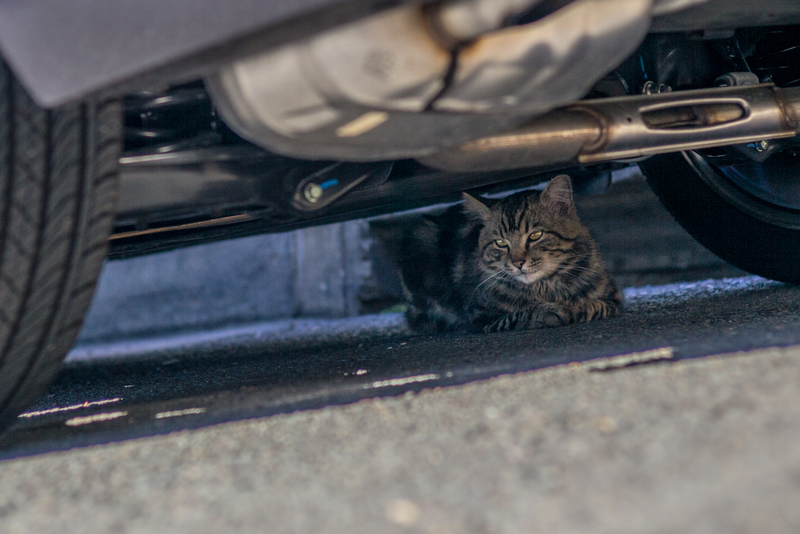 I nickname the kitty Low, for my lying down to capture the moment and for the animal being beneath a car in shadows. I extensively edited the DNG RAW file in Adobe Lightroom Classic CC to make Low pleasingly visible, which he is not in the unaltered original. Vitals, for the Featured Image, aperture manually set: f/2.5, ISO 200, 1/4000 sec, 50mm; 9:17 a.m. PDT. Update, April 11, 2018: My wife and I met the woman who feeds this cat, and several others. He’s a friendly former stray named E.T., for Exotic Tail—so I will need to get a more full-body photo so you can see. Also, I learned that the kitty linked to above as Grand, disappeared about two months ago, and is presumed dead from old age. The beastie, whose name was Shadow, lived in the area around the overlook for 18 years. Update, Aug. 16, 2018: Around 8:30 a.m. PDT, my wife and I arrived at the Adams Avenue overlook only to find E.T. being fed a big breakfast—and presenting portrait opportunity. 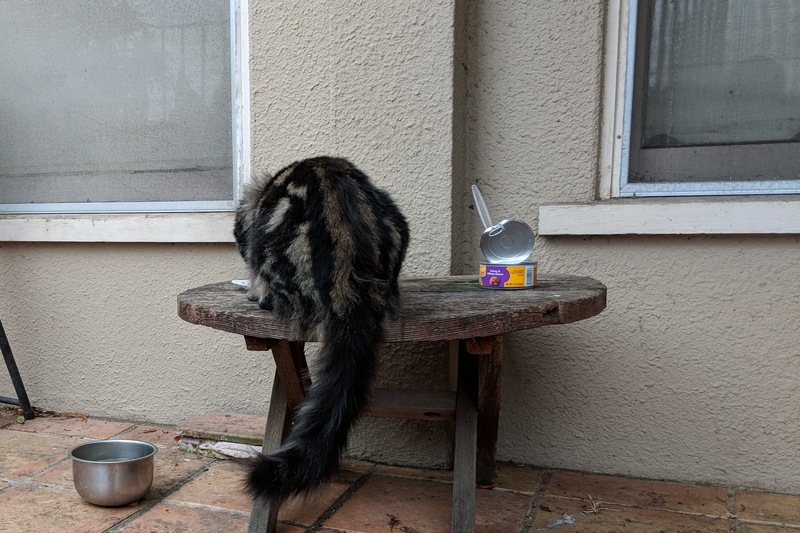 As promised, I add not one photo, but two, showing off his luxurious tail. Vitals, shot with Google Pixel 2 XL: f/1.8. ISO 50, 1/176 sec, 4.459mm. The second, captured two minutes later, is same except for ISO 52 and 1/867 sec. Once a stray, E.T. is an indoor-outdoor cat now. He has accepted a home, at the residence where he is fed. Not to be ignored: Scruffy, Roly Poly, Woo, Skull, Biscuit, The Colonel, White, Chipper, Frisky, Stretch, Needy, Farfisa, Mates, Hunter, Pee-Pee, Blue, Blue Too, Bonded Pair, Patience, Fess, Jumper, Frenemy, Looker, Cozy, Scout, Lurks, Skit, Mini, Betty, Black and White, Stalker, Bell, Chill, Sammy, Scratch, Poser, Star, Grey and White, Watcher, Herman, Comet, Roman, Willow, Chub, Nimbus, Watson, Lilo, Kit, Pepe, Twilight, Sebastian, Spot, Booger, Ash, Veruca, Riley, Mellow, Bonde, Flower, Glass, Black, BeBe, Fang, Bruce, Siamese, Pounce, Tortie, Haiku, Fraidy, Peso, Daniel Tiger, Dusk, Stride, Dainty, Spry,Tabby, Betty Too, Still, Levi, Shadow, Sophie, Wink, Ferals, Momma, Charlie, Tux, Cool, Benny, Jellicle, Itchy Valentino, Goldie, Anthony, Amanda, Siesta, ChaCho, Charlie, Too, Mika, Crystal, Seeker, Mittens, Dancer, Smokey, Monkey, Captain Blackbeard, Season, Maven, Tink, Chunk, Curious, Hanoi, Bella, Tarry, Guido, Maxine, Mr. Kitty, Peohe, Panda, Frankie, Moose, Twain, Willow, Too, Brawn, Reddy, Burglar, Laramie, Lupe, Bright, Tom, Charm, Buddies, Boss, Ohana, Seer, Fresh, Token, Lola, Carl, Bramble, Finny, Cal, Tipsy, Zander, Mew, Penny, Charlie (the Third), Bob, Apple, Persepolis, Sebastian, Too, Holiday, Snow, Desire, Luci, and Torbie.